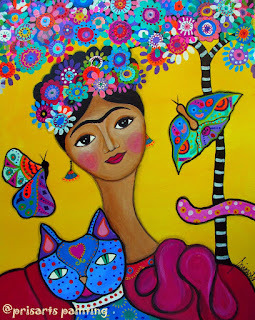 • MEXICAN THEMES • FLOWERS AND BLOOMS • DIA DE LOS MUERTOS • TREE OF LIFE • WHIMSICAL THEMES • OWL • ANIMAL ART • I am a visual artist. I love creating paintings for Restaurants, Commercial Areas, Office Art and for Personal Collection. I love scribbling, painting scenes that catch my eye and ideas/memories that move me. 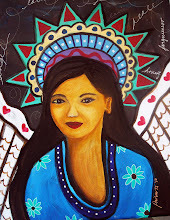 I love painting folk art angels, mermaids,seascapes,flora and fauna and musical instruments. I am a self-taught artist living in Orange County, California. I am also an Interior Designer. I graduated with Degree in Bachelor of Fine Arts at University of Santo Tomas in the Philippines. I have been painting for almost 12 years as a hobby. Then i started giving them as gifts for birthdays,weddings and different occasions. As a Designer, some of my artwork has been used as accessories for my client's houses, stores and offices. I started posting my work online a few years ago, and was lucky to get buyers and orders. I like using joyful, whimsical colors. It adds fun and pleasure in my paintings. In fact, the most common comment I hear regarding my work is that my artwork just makes people smile. I have also been commissioned to do various paintings as gifts and to add to one's personal collections. I have sold my art all over the world. I am a member of United Folk Artists. I accept custom-made paintings. Send me an email at prisarts@aol.com for pricing. All rights reserved. All reproduction rights are retained by the artist.. Simple theme. Powered by Blogger.